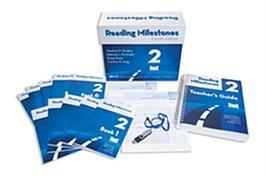 Word Cards Vocabulary words taught in the program are displayed in two formats: as reproducible PDFs on the Reading Milestones Reproducible Materials Flash Drive and as boxed, printed cards available separately. The cards are grouped and alphabetized by corresponding reader and numbered accordingly. Students can use the cards for practice in the Spelling and other lesson activities, in group games, and as flash cards in individual or group review. Included in the Package: TeacherÃ¢â‚¬â„¢s Guide; a boxed set of 10 Readers; Reproducible Materials; Flash Drive containing reproducible PDFs of Workbook activities, Spelling, and Word Cards; and a 10-pack of Student Achievement Records, all in a sturdy storage box.